Photography and Text By Jeff Nussdorf © All rights reserved. Daniel Fischer is an artist from Slovakia who is in Tucson on a fellowship with the University of Arizona. He is displaying some of his art and photography in the Tucson Museum of Art. 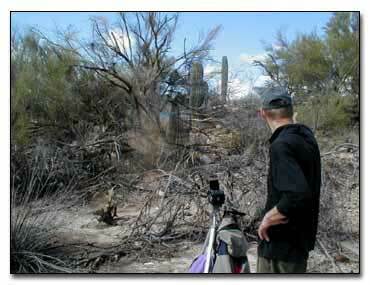 The above photograph shows him taking a photograph in the Arizona desert. What is he taking a photograph of? Click Here To Discover His Use Of Photography.